During December much of the enemy activity took place about eighteen miles to the north of the 2/5 Cav area of operations - the Second Battle of Tam Quan in the northern part of the Bong Son Plains pitted the Division's 1st Brigade against the 7th and 8th Battalions of the 22nd NVA Regiment for over half the month. Consequently the Crescent to the south and east of Bong Son was relatively quiet. C Company continued working in the mountains and river valleys west of the coastal plains, in particular around the southern end of 506 Valley. There was not much contact during this quiet period. C Company, accompanied by A Company, returned to The Rockpile about the middle of the month. 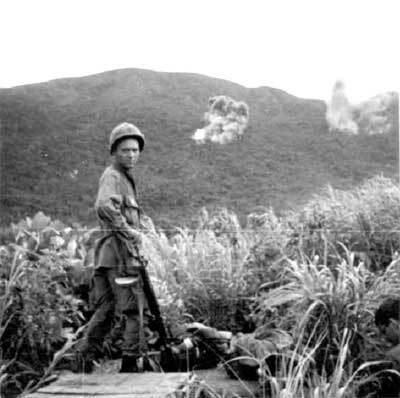 This small black mountain right at the edge of the sea and just east of the Nui Mieu (mountains) had been the scene of heavy combat during September of 1967, but the area was now quiet. After several days spent searching caves and rock shelters, C Company was pulled out of the field and given the task of guarding the Highway 1 bridge at Bong Son. 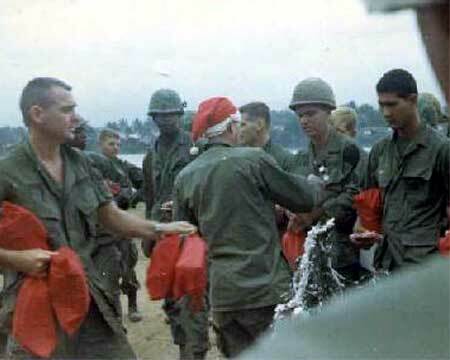 With Christmas approaching this was a much-appreciated duty. In my recollection, we were indeed making a night movement in an area of hedgerows and fields (may have been overgrown rice paddies, as the 506 Valley contained many abandoned/inactive farm lands). Trevino, the company point man this night was moving on a trail and, in the dark, hit a trip wire while moving through a gap in a hedgerow. It was a large explosion (may have been 81mm or 105mm round) and I think he was killed instantly. I remember we brought in a night Medevac, using a strobe light I think (although I could just be recalling the strobe on the Huey) and basically abandoned whatever night mission we had been moving on. As the movement was in the dark, I don't see how anyone could have avoided hitting the booby trap. According to the Morning Report, Treviño died at 9 PM from wounds to the head and chest. Santa making the rounds. 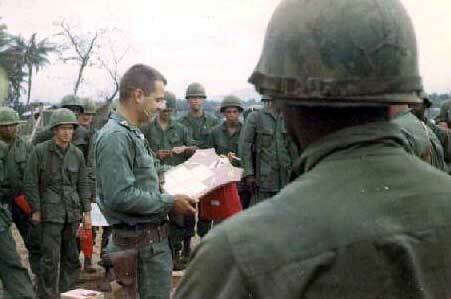 To the extreme left is CPT Learish, third from the left in the background is CPT Estep.